Gutter Cleaning FAQs - Eg. How much does a gutter cleaner cost? Why should I have a professional clean my gutters? How much does having gutters cleaned cost? Do you have a gutter cleaning price list? Will I need to be there when you are working? Can you inspect the roof and gutters while you are up there? Can you do any repairs on the roof? Do you recommend having 'Gutter Guard' (or 'Leaf Guard) installed? How do you access high roofs and gutters? Will you get rid of any debris that falls onto the ground? How often do gutters need to be cleaned? How should I prepare for the gutter cleaner before he comes? Can you give me a tax invoice? Do the gutter cleaners have all the necessary insurance cover? Why have a professional clean my gutters? The most obvious reason is because it can be a very unsafe for the inexperienced and unprepared householder. Our gutter cleaners have years of experience working at heights and using harnesses. We also carry powerful blowers and other specialised equipment to make the job safer and more efficient. This is not to mention that having clear gutters helps reduce the risk of fire, extends the lifespan of the gutters and makes the place look tidy. How much does it cost for gutter cleaning? Do you have a gutter cleaning price list? If you provide your address along with a brief description on our 'Get a Quote' form, we can check the building with Google Satellite Images and Street View. We can normally give you the price the same day you make the enquiry. The price is based on several factors, such as how high the roof is, how full the gutters seem, the kind of roof and angle it's pitched at. Whatever it does cost though, will be cheaper than getting a roofer to fix serious damage due to lack of maintenance. To give you a rough idea: A small, single storey house could cost as little as $150. A large 2 storey house might be between $210 - $390. Not in most cases. Usually, we can access the roof with a ladder and there is no need for the householder/business owner to be there while we are working. Please mention if you have a dog. Yes we can. We can let you know if there are any broken tiles, bad joints or any other obvious causes for problems. 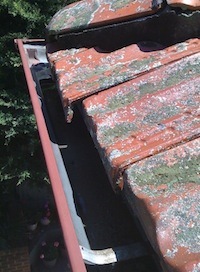 We can also let you know what state your gutters are in and take before and after the gutter clean photos to show you. We can do minor repairs, which include replacing or repairing broken tiles, sealing gaps with silicone, and other similar jobs. First, we clear any leaves or sticks on the roof and gully areas. Then, wearing gloves, we scoop out the leaves and other gunk from the gutter into bags. Then, we generally clear any remaining debris with a high powered blower. We also clear out the downpipes, if necessary, using special tools to reach deep down into the pipes. Of course, we clean up any mess around the property too. Do you recommend having 'Gutter Guard' (or 'Leaf Guard') installed? 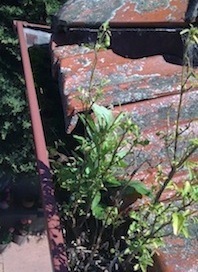 In some cases, having a leaf guard covering the gutters is useful. It is essential for areas in a high fire danger. 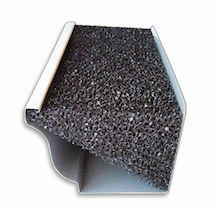 These areas require fire resistant gutter guards, such as the 'Gutter Protector'. Other benefits are: Avoid blocked downpipes, rusting and leaking gutters, allows cleaner and faster flow of water to rain water harvest tanks. Over the years, El Toro Gutter Cleaning has seen many different types of gutter guards in action. The main problem with mesh-type protection is that they make it hard, if not impossible to clean to the bottom of the gutter. Eventually, no matter what leaf guard you have, dirt will get to the bottom of the gutters and they will need thorough cleaning. The 'Gutter Protector' is by far the best system we've seen. It's UV resistant long-life, CSIRO tested fire resistant, and it's excellent value for money! We would be happy to talk you through what's most suitable for your place. Each building needs to be assessed individually. We always work safely and we are fully covered by insurance. Where possible, we use a harness, as per instruction by the ‘Work Safely at Heights’ qualification. All our workers are Operational Health and Safety (OH & S) certified. Above all, we use common sense to remain safe at all times. Will you tidy up any debris that falls onto the ground? Yes we will. In fact, we normally leave the property cleaner than when we arrived. We can also take away the leaves if necessary. This depends on the area you live in, in particular, the amount of deciduous trees that are higher than the roof line. Some of our most regular clients have them maintained monthly, others 3-4 times per year. Some have them cleaned once a year. 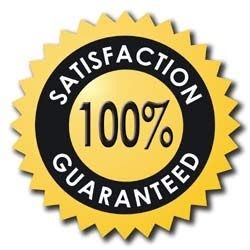 If you have a good quality Gutter Guard, normally about once every 2-3 years. We can often carry out the job within the same week of your enquiry. To speed things up we can inspect the job by using Google Satellite and Street View. Please mention if there is a deadline for the job to be done by. Please keep in mind that high winds or rain could make it unsafe to work. In this case, we'll contact you to reschedule. Gutter cleaning can cause it to get quite dusty for a short while. So, it's best to close your windows and not have any clean washing out nearby. It's also best to do such things as window cleaning and outdoor painting after the gutters have been cleaned. You can pay the gutter cleaner when he comes to do the job either by Cash, Bank Transfer or Credit Card (Visa or MasterCard, only for domestic jobs). We don't charge commission to use credit cards. Our standard payment terms are 1 day from the invoice date, but this can be adjusted on mutual agreement. Of course! Whether it is gutter cleaning for a Domestic, Commercial or Strata property, we are happy to issue a tax invoice. Yes. We are covered by $20 million Public Liability insurance and all workers are also covered by Workers Compensation Insurance. We are happy to forward a copy of the Certificates of Currency on request. Is it WindowWasher or El Toro Window Cleaning? Windowwasher.com.au is the website address for El Toro Window & Gutter Cleaning. As for where does 'El Toro' come from?, you'll have to ask the gutter cleaner himself about that!